For us, feathers are a must-have all the time, but at the moment they are hot stuff and fashion forecasters are saying feathers will be everywhere as we move into the next season. With this in mind, we're delighted to be able to introduce Coldharbourlights to the RSG catalogue. 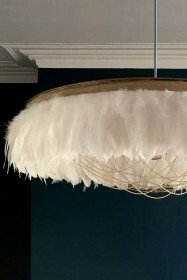 Coldharbourlights’ exquisite range of feather chandeliers create a bold and beautiful focal point for a stylish interior. There is a theatrical heritage to these chandeliers that offer an experience with a playful edge. The goose feathers will respond to a breeze or give you the softest stroke if you brush by them. The chains are responsive to movement; they can swing and disrupt their patterns but will always return. There is an echo of the elegant designs of the opulent Art Deco period. 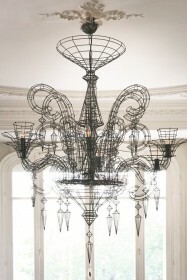 The inspiration for these chandeliers came, surprisingly, from looking at ways to re-purpose bicycle parts. The bicycle wheel rim, with its balanced distribution of perfect holes became the starting point. The resulting combination of powder coated golden wheel rims, ball chain, feathers and crystals in these unique feather chandeliers makes for a punchy mix of decadent, luxurious materials alongside functional, utilitarian elements. The shades do not come with a flex, they attach to existing ceiling pendant fittings so that you don't need to do any extra work - no electrician to wire up a new ceiling fitting and no builder to attach hook and chain. Should you wish to change your flex length or ceiling rose, choose whatever works best for you as long as the bulb holder is the standard B22 or E27 size that you would usually have on a domestic pendant fitting. 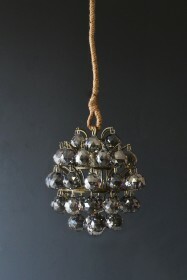 These fabulous chandeliers are made to order, especially for you. As each one is bespoke, no two are exactly the same. This means they take a bit longer to get to you but the result will not disappoint! 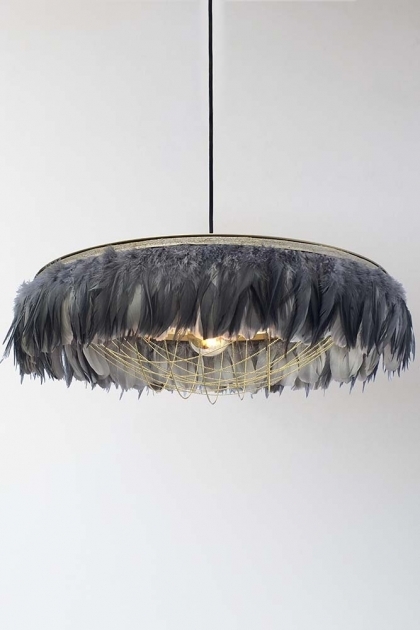 Introduce this Fabulous Feather Chandelier Featuring Chains into your home and it will become a bold centrepiece, a focal point and a stunning piece to integrate or to base your interior design around. This item is bespokely made just for you & therefore will take up to 4 weeks to be delivered and is exempt from our standard returns policy so unfortunately we cannot accept returns.